Scottish television isn’t something we often consider as a solo entity. Sure, we get TV shows set in Scotland, and we’re even got an openly Scottish Doctor Who, but often they come under the banner of broader British (and specifically BBC programming). But Scottish TV from the fifties to the eighties reflected a massive, mercurial struggle between the tartanised version of Scotland that had been popularised to non-Scottish people, and attempts to depict Scotland as it really was - a sometimes flawed but ultimately fascinating look at a country that was evolving along with the rest of the UK. So, first off, what do I mean by tartanised television? Where the hell was British music heading in the year 2000?! For anyone who had ever picked up a copy of NME it was a curious landscape. Britpop had become a tired, cliched affair and finally snuffed it around 1998, but since then there had been little identity in British indie rock 'n' roll. Instead, a myriad of up and coming bands were all scrambling round toilet venues trying to make sense of it all. Following them were Channel 4 and The Barfly Sessions. Has anyone amazing ever taken on the role of Sherlock Holmes? Benedict Cumberbatch, Peter Cushing, Jeremy Brett, Robert Downey Jnr, Basil Rathbone and Tom Baker to name but a handful. However, there's one name amongst these actors which truly stands out as a superstar. 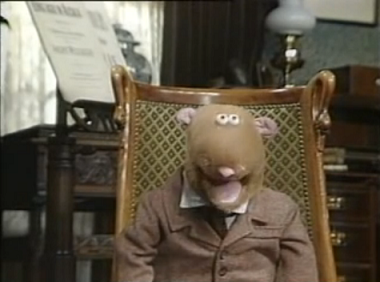 That's right, Roland Rat even tried his hand at the role in Tales of the Rodent Sherlock Holmes. Dr Watson (Kevin the Gerbil) keeps a nice diary of all his cases with Sherlock Holmes (Roland Rat), but it's not just packed with stories about hounds and studies in pink. In fact, there's a whole range of cases which only get the briefest of mentions. However, these adventures see our favourite Baker Street duo taking on such startling cases as chasing a dastardly canary trainers, investigating a mysterious, empty box and even trailing the fiendish Blue Carbuncle! Popping up along the way to thwart Holmes and Watson are a selection of British TV treasures including Mollie Sugden, Barbara Windsor, Rodney Bewes and Christopher Ryan. Tales of the Rodent Sherlock Holmes was a seven episode BBC1 production which first aired as part of the Saturday Starts Here! early morning schedule in March 1990. 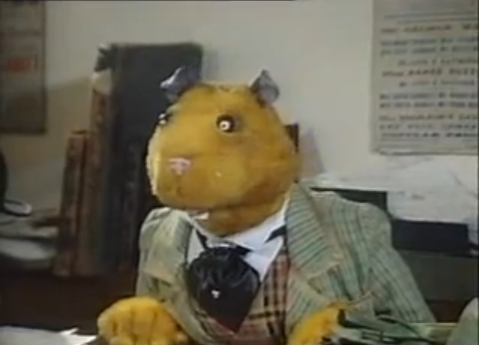 The series was written by long term Roland Rat collaborators Dominic MacDonald and Colin Bostock-Smith who had previously written for Roland and the Rat Race and Roland Rat: The Series. Steve Haggard was the producer and said, at the time, that "Roland Rat is the latest in a long line of distinguished actors to pull on the cloak and deerstalker of the master detective, but he's probably the first to wear sunglasses". The series was repeated once, later on in 1990, as part of the CBBC schedule, but has not been seen since. 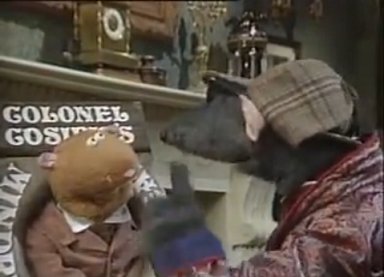 A brief clip of the series was shown in an episode of The Pig Attraction in 1993 as Roland's life story was laid bare. 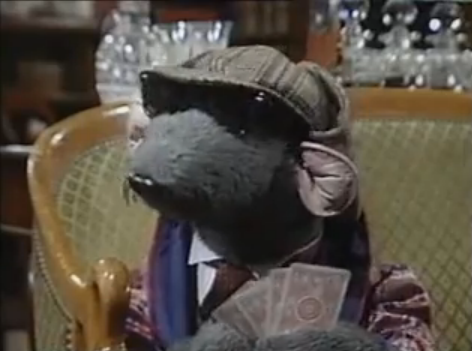 We could always remember Roland Rat playing a Sherlock Holmes role, but we were convinced it was just a sketch from one of his shows. However, evidence began to point towards it being a fully fledged show of it's own, so we had to don our deerstalker and a do a little investigating. Holding our magnifying glass terrifying close to our eye we soon discovered that, yes, it was a series in its own right. In fact, it was the second spoof series that Roland had embarked on after 1987s Ratman take on Batman. It didn't take long to track down an episode on YouTube, so we got comfy and hit the play button. First off, dear God, what an amazing set for Sherlock's Baker Street pad. It looks like a classic BBC costume drama set where plenty of effort and money has been involved. Errol the Hamster's theatre office is also full of shabby character, but the rest of the sets are mostly made up of backstage areas, so it's difficult to give them any real identity. The costumes, too, are rich affairs which give the show a really strong Victorian vibe and add to the authenticity. All the usual gang feature in various roles e.g Errol the Hamster and Little Reggie, but it's a shame we didn't see any mention of D'Arcy De Farcey as we always liked his spangly suits. We've only seen the one episode and Roland appears to be in good form with his usual barbs - our favourite in this is where he claims Keith Harris died years ago. 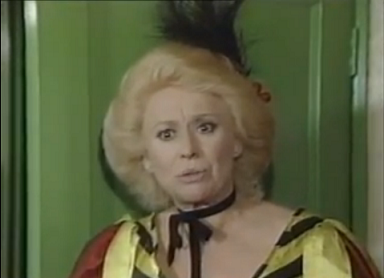 Barbara Windsor turns up and does her Barbara Windsor thing amazingly well and you can't help but smile at her. However, the actual story, about a canary trainer causing havoc at the local theatre just didn't engage us. It's got a nice Scooby Doo-esque twist, but there were no strong laughs or exciting action. 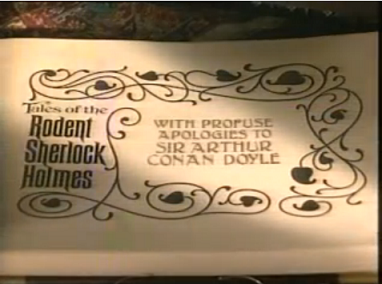 Perhaps a better idea would have been to spoof existing Sherlock Holmes adventures more closely. Working with such great source material means you've already got a gripping yarn on your hands. The humour can then come from mocking asides and sharp gags as the action moves the story on. As it is, though, there's a horrible one-pace feel to proceedings and we were left waiting for it to end. 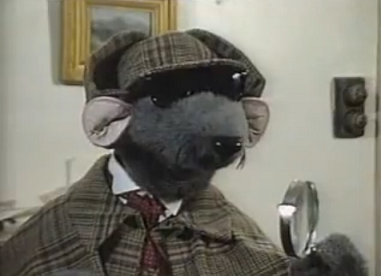 It turns out that Tales of the Rodent Sherlock Holmes was the final series of Roland's mainstream existance. The BBC had been trying to find him further vehicles since Roland Rat: The Series, but nothing had really landed in the public's consciousness. He would later pop up on Channel 5 in 1997 in LA Rat, but since then it's been nothing but guest appearances. Still, he had a great run at the top and he's still capable of spellbinding TV as he showed when he destroyed Adrian Chiles in 2010. We'd watch more to see if this episode was just a bum note, but we have the feeling that perhaps it was the right time to close the book on Roland's glittering career. There isn’t a British sci-fi series alive that doesn’t owe some debt to Nigel Kneale. And I’m not just saying that because I needed a good first sentence - go ask Mark Gatiss, any writer for the original Doctor Who series or noted critics like Kim Newman if you don’t believe me. In an almost unanimous move, British television has taken Kneale’s Quatermass series as the gold standard for what can be achieved in sci-fi tv shows. What has kept an obscure, high-concept sci-fi show from the fifties afloat well over half a century after it was broadcast? 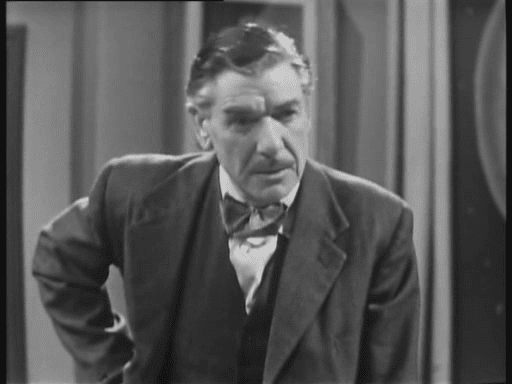 The first and possibly most important factor in the three-part Quatermass serial (The Quatermass Experiment, Quatermass II, and Quatermass and the Pit) broadcast between 1958 and 1959 Is Quatermass himself. That instantly memorable name lodged itself permanently in the memories of thousands of science fiction fans, directors, and writers alike, because Quatermass was something a bit different. He wasn’t a buffed-up action hero who you’d be more likely to find wielding a big gun than you would a firm grounding in rocket science, nor was he a disarmingly charming take on the scientific Casanova. 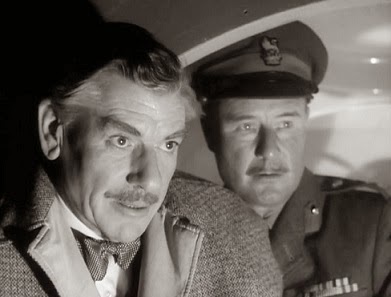 Quatermass is the hinge point of the Quatermass universe; everyone around him is losing their heads while he keeps his. He’s a moment of silence around which the wall-to-wall ideas of the series could rotate. He’s the first recognisably science-fiction hero, a leading man who didn’t have anything to prove to anyone and did what he did because it was good or because it was interesting. 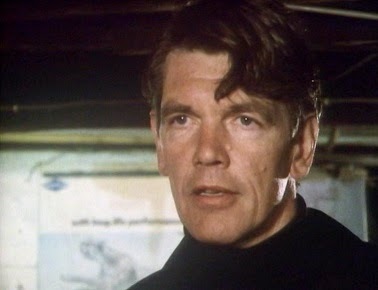 Portrayed by no less than seven actors since his inception in the fifties, Andre Morell’s iconic performance in Quatermass and the Pit remains the ultimate interpretation of his character (and I’ll take to the mat anyone who says otherwise). But once you take a step back from the character himself, there’s a lot more going in this series than just science fiction. For some reason that’s beyond me (as someone who thinks Doctor Who might well run through my veins), science fiction is often seen as a niche subject, something than directors and writers have to fight to make interesting or populist. Almost seamlessly, Quatermass worked in elements of detective shows, horror, speculative fiction, biblical terror and body horror into what amounted to a strikingly interesting science fiction framing device. Here was proof, undeniable proof, that aliens and beings from another world weren’t just little green men being tussled with by shrieking women and sturdy men. They could absorb and examine other genres with ease, permanently opening up the science fiction genre in ways that Doctor Who, Battlestar Galactica et al should be eternally grateful for. 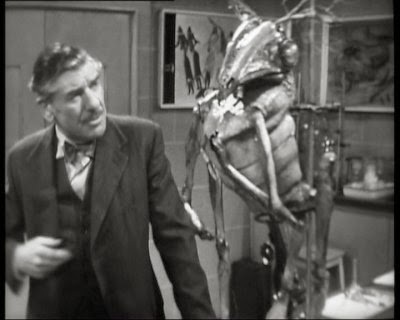 To suggest that the Quatermass serial was niche because of its sci-fi credentials is to assume that the people you’re showing it to hate all television ever made. Quatermass and his exploits represent a TV-license justifying pinnacle of the BBC’s sci-fi output. Genre-bending, ground-breaking, and impeccably produced, just don’t argue this with me after I’ve had a few drinks. Because I can’t be held responsible for my actions. Who hasn't found starting a new job a tough ordeal? Having to learn new procedures, enraging people with your lack of experience and working out who the best person is to lend you 20p for the coffee machine - it's one hell of a slog! Just imagine the chaos that would ensue if you had a workplace rammed full of new recruits. All careless and wet behind the ears. We feel nothing, but deep, deep sympathy for any one put in a position to mould such a ramshackle bunch into a well oiled machine. You only have to take a quick look at Rockliffe's Babies. Sgt. Alan Rockliffe (Ian Hogg) is not a happy man. There's nothing he likes more than banging up the bad guys, but he's currently got a thorn in his side. The literal form of this thorn is a set of new PC's straight out of Hendon Police College. And, well, to put it politely, they're letting the bad guys slip through their careless hands. Rockliffe's Babies sees Rockliffe trying to take control of his fledgling officers as they run amok through the streets of North West London. Nothing will stand in the way of their buffoonery and a predisposition for love, hunger and cockiness are all causing Rockliffe's blood pressure to shoot through the roof. Two eight-episode series of Rockliffe's Babies aired between 1987 - 1988 on BBC1. 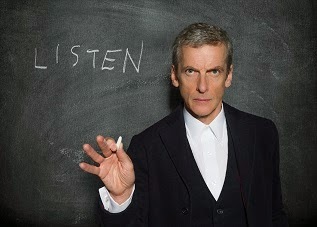 The series went out in the 9.30pm slot on BBC1 and episodes were 50 minutes long. The series was devised and written by Richard Keefe who had previously tackled the law genre with Crown Court a few years before. 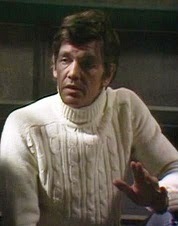 Leonard Lewis was on producer duties and had previously worked on shows such as When the Boat Comes In, Second Verdict and The Good Companions. The gritty and deprived council estates which featured heavily were mostly located in the Kensal Rise area of North West London. Rockliffe's Babies received a couple of repeats up until 1990, but that was the last time it was seen on terrestrial TV. The series later received repeats on UK Gold. A spin off series, Rockliffe's Folly, aired in late 1988 and saw Rockliffe relocating to the more pastoral surroundings of Wessex, but lasted only 7 episodes and was never repeated. We read about Rockliffe's Babies somewhere online and the basic premise was enough to get us interested. As luck would have it, the Archival TV gods were looking down on us and delivered two episodes via the power of YouTube. The series starts off with a lone Police car racing across London's iconic Westway and immediately you're plunged into the heart of a frenetic, uncertain city where pockets of crime are just waiting to bubble up and engulf society. Just as you're recovering from this delicious scene setter you're knocked for six by the amazing theme tune written by Joe Campbell and Paul Hart. Featuring a guttural child's choir, the tune is an ode - almost nursery rhyme like - to life on London's deprived council estates. And then they go and stick some wonderfully 80s saxophone over it. It's an enthralling mix of sounds that we can only describe as gutterurchin funk punk lounge poetry. Devastatingly fantastic intro aside, what's the actual show like? Well, it's the 1980s, it's London and at the very nub of the show are the police. What's that? Oh yes, it's The Bill calling! Rockliffe's Babies is very much in thrall to The Bill and we can't argue that the atmosphere of the show differs greatly. Unfortunately, Rockliffe's Babies doesn't contain the high calibre of characters that The Bill did. There's no Burnside, no Tosh, no Roy. Not even a Reg! 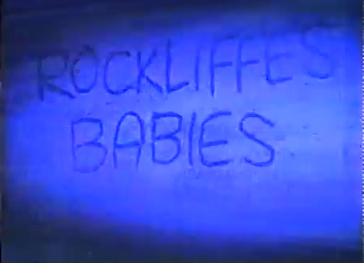 However, it wouldn't be fair to label the characters in Rockliffe's Babies as terrible. Well, you know, they're a mixed bag. Rockliffe comes closest to legendary status and it's no surprise that his cantankerous rages and old school methods spawned a spin off series. In fact, he's like a proto Gene Hunt, quite happy to give a slap and turn a blind eye. Frustratingly, and quite inexplicably, Rockliffe features for just 30 seconds in the opening episode, but even then he takes the show by the scruff of its neck in an instant. Gerry O'Dowd (Joe McGann) is the ladies man of the station with a dazzling charm he can flick on in an instant. However, he also displays an innocence and naivety that frequently pulls the rug from under his feet. He's the quintessential Joe McGann character, so what more can we say? Well, he's not quite Charlie Burrows in The Upper Hand, but immensely likeable all the same. Steve Hood (Brett Fancy) is the local kid who knows the gritty streets like the back of his hand. We were really interested in his mysterious background which is shrouded in thinly veiled racism and a dubious association with the National Front. He's not one to play by the rules and has an undercurrent of menace bubbling beneath his wide boy exterior. The rest of the cast, though, are a frustrating bunch. They feel like unfinished sketches of characters and the cast struggle to really make these characters sing. It's difficult, too, when all the characters contain one fatal flaw - they're useless and completely inept! We're always willing to suspend our disbelief, but seriously, come on! How long would a police team like this last? They're ABSOLUTELY USELESS! It's all well and good in a comedy like Operation Good Guys, but in a drama? Nah! We're not having it! Their inability to stay level headed and not bugger things up actually frustrated us so much that we ended up cheering the bad guys on! That's not to say that the show doesn't have a certain charm and the actual plots are quite entertaining, but everything always feels inferior to what was going on in Sun Hill over on ITV. Perhaps the show should have marked itself out by concentrating on Rockliffe, O'Dowd and Hood. There's excellent dynamics to pit against one another and, by concentrating on a smaller, more intense group, would have reduced comparisons to what was going on at Sun Hill over on ITV. We'd certainly like to see more episodes as anything London based in the 80s with a hint of grime always ticks our boxes, but for now, our go-to police option will be The Bill. We will, however, be setting Rockliffe's Babies theme tune as our ringtone! A bitter row has erupted at the BBC in wake of the decision by drama chiefs to axe the popular cop series Rockliffe's Babies and put the hero Sergeant Rockliffe out to grass in leafy Dorset. Corporation bosses decided to let the current series, which recently pipped 10 million viewers, run its course. 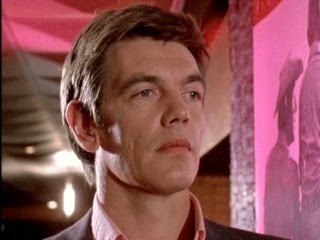 But the jobs of all the main actors with the exception of lead performer Ian Hogg, look certain to go afterwards. A Rockliffe source told The Stage and Television Today; "It's ridiculous that they should change the format to a rural Dixon of Dock Green and lose the fire and bite of London life. I don't know why it is, especially since the ratings were doing so well. Are they afraid of the forthcoming violence guidelines?". Ex producer of the show Leonard Lewis refused to confirm that the revamp is under way but a BBC spokesman said that the new series will involve certain changes. He said; "It's early days, but we believe it will be a spin off police series. There will be quite a few changes.". Believe it or not, but there was actually a time when Curious British Telly's life wasn't consumed entirely by archive television. It was merely a passion which would briefly manifest itself when we watched old episodes of Dr Who and tried to remember that children's tv show about the artistic dog. You see, our obsession before this glorious folly was... MUSIC! We'd attend gigs regularly, bought NME every single week for 9 years and even started a few fan sites on Geocities. The passion for us, fuelled by our teenage desire to be hip and cool, gradually faded, but for the people involved in Ancestral Voices music was a way of life. With an amazing title that sounds like the greatest Led Zeppelin album never recorded, Ancestral Voices was the BBC's attempt to educate the masses about the history of music. Sure, everyone loved music, but did they know anything about its origins prior to Dylan going electric? The answer was "probably not". Therefore, it was time for David Munrow - master of the bassoon and even more curious sounding instruments - to step forward and explore the history of sounds, rhythms and singalongs. The series saw Munrow detailing the evolution of instruments such as horns, flutes and hunting bows (the godfathers of stringed instruments) as well as the ancient myths and practices surrounding them. Munrow was flanked by a myriad of musicians who were on hand to demonstrate the mysterious sounds of these ancient instruments. A willing audience were also present to chant/sing in the most peculiar tongues. Ancestral Voices was borne from director Paul Kriwaczek's love of ancient civilisations and desire to create educational programmes. Kriwaczek was backed by well loved producer Victor Poole who amassed a varied career working with the likes of Fanny Cradock, Anthony Burgess and Jane Glover. Five episodes were transmitted in Spring 1976 on BBC2 on Monday evenings. The series was later repeated on BBC1 in Autumn 1976. Further repeats of the series came in 1978 (BBC2) and 1980 (BBC1). We were browsing through the BBC's fantastic Genome project when we stumbled across Ancestral Voices. Now, we love all things retro, but here was a completely different league of retro, they were going waaaaaay back. This we had to investigate! Online searches revealed not even a clip, but our dear old friends at the BFI were only too happy to furnish us with an episode. The main aspect of the show which grabs you is David Munrow's passion. He's absolutely obsessed with the history of music and, at times, he works himself into an enthused rapture as he preaches passionately about the evolution of music. And, yes, we loved seeing and hearing these ancient instruments. In fact, it gave us a great perspective on just how Royal Blood have come to be smashing their instruments wildly on stage and creating such a beautiful racket. The show is just too specialised for the average Joe! We love a bit of educational telly, but this went in to far too much depth! It surprised us, actually, that this went out in an early evening slot as the whole show feels much more like an Open University programme. The show appears - although we only watched one episode - to be entirely studio bound and this contributes to a repetitive format where the camera just shifts from one corner of the studio to another. Some location filming could have easily broken this up. For the first time in our history of visiting the BFI, we actually had to fast forward through the tape as it was boring us. The show's dated terribly too. The fashions and haircuts are just so 70s that it hurts. Just how huge can a shirt collar be for Christ's sake?! And then there's the musicians. Imagine some German campers with the cheesiest grins you can imagine and you're not even close to the shivers we experienced down our spine as we watched them bob their heads sinisterly to the ancient rhythms. And when the audience linked arms and began to sing a drinking song against the lilting sounds of a lyre and flute, our heads were in our hands. We don't think we could stomach another episode of this. The intentions are first class, but it's such a niche area that only a tiny audience would get enjoyment from Ancestral Voices. We may have found it a cringey, borefest at times, but David Munrow' passion was evident throughout and was impossible not to admire. Sadly, before the programme even aired he had committed suicide. This tragic event has been contributed to depression and followed a suicide attempt in the previous year. Despite working with his passion on a daily business it was no match for the debilitating effects of mental illness. It's a stern reminder of the fragility of our mental health and how, at our lowest points, even our greatest loves can't save us. Duggan - The Greatest Doctor Who Companion That Never Was! Yes, it's time to talk about Duggan, one of the most entertaining and exciting characters to ever set foot within the crowded universe that is Doctor Who. Played by Tom Chadbon, Duggan only ever made one solitary appearance in Doctor Who, but, sweet Jesus, didn't he make one hell of a rambunctious impact! His case was helped, of course, by this lone encounter with the Doctor coming in The City of Death which is regularly voted as one of the finest Who stories transmitted. When we first watched The City of Death - nearly 25 years ago now - we anxiously sat on the edge of our seat willing with all our might that Duggan would join the Doctor and Romana for further adventures in the Tardis. We've experienced many thrills in our long love affair with Doctor Who, but never had we before (or since) found ourselves pinned down in astonishment at the rapid creation of such a fan favourite. Sadly, our dreams were dashed and Duggan was limited to just the one serial. However, you can't forget Duggan once you've encountered him, so we decided it was high time we celebrated the man, the myth, the legend! Who Was the Man behind Duggan? With a voice as smooth and textured as the finest cognac, Tom Chadbon has been regularly popping up on our screens since the late 1960s. His appearances haven't just been limited to that tiny screen in the corner of your front room either. Chadbon has maintained a presence on the silver screen and film roles have included Juggernaut, Tess and more recently the 2006 version of Casino Royale. He continues to act - most recently in Casualty and Father Brown - and his silky, rich voice means voiceover work is never short. If you need further proof that Chadbon is an utter gent, just take a look at our Twitter followers. We're incredibly proud to have @TomChadbon on there. What's all the fuss about then? Well, let's start by taking a look at Duggan's role in The City of Death. 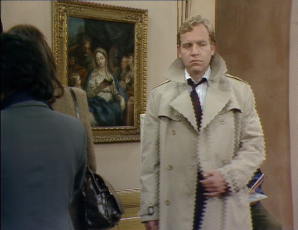 We first encounter Duggan in the Louvre where he's trailing Countess Scarlioni. It's all part of his investigation into Count Scarlioni's uncanny knack of discovering and selling priceless works of art. 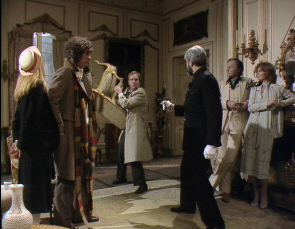 Duggan mistakenly identifies the Doctor and Romana as being in on the act, so begins following them in pursuit of answers. After jabbing a gun in the Doctor's back and interrogating him and Romana, Duggan reluctantly decides that they're on his side. What, though, can Duggan bring to the table when two superminds are already on the case? Duggan may not be the sharpest spoon in the cutlery draw, but he's a got a mean punch on him. At the slightest hint of danger he displays his admirable courage by readying himself for a fight, be it raising an antique chair above his head or just putting his dukes up. Does Duggan care that Count Scarlioni/Scaroth has the capability to obliterate Paris at the flick of a switch? No and he displays this blasé attitude by knocking him out. Twice. In fact, Duggan's second ruthless blow to Scaroth's chin is described by the Doctor as "Possibly the most important punch in history". 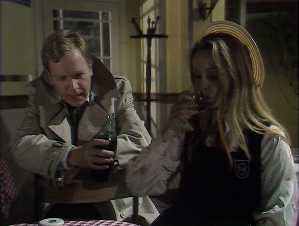 In a brief scene with Romana, Duggan tells her how his heavy handed approach may not be everyone's cup of tea, but it gets results. And he's not changing for anyone. This is all as he smashes a wine bottle open and pours them a drink. What a bloody minded and magnificent man! Why Did Duggan Captivate Us So? We first watched The City of Death one sunny day in 1992 and we were transfixed from the very first second. Not only did it have one of the finest Who scripts ever by Douglas Adams, but it contained the freewheeling Duggan in his flowing mac - a mac that Tom Chadbon insisted on to help build Duggan's character. 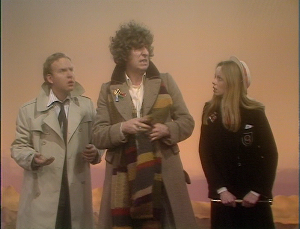 Now, we mentioned earlier that the Doctor and Romana were super brains. Duggan, not so much. In fact, Count Scarlioni dismisses Duggan early on as posing no threat when he quips "He's too stupid to bother us seriously". 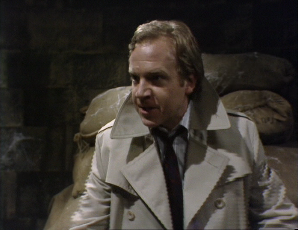 Sorry, Count Scarlioni, but it looks like you've completely underestimated Duggan's potential. His brute force - he knocks down a 500 year old wall for god's sake - is the perfect foil to the numerous superior intellects on hand. Sometimes it's not enough to be able to calculate a complex plan to save/destroy the universe. Every now and then you also have to be willing to deliver an ironclad punch up the bracket. It was this rough and ready attitude that we couldn't get enough of. 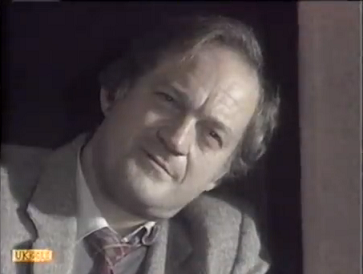 Duggan also fulfilled the role of being the translator for the viewers. Romana was far too intelligent to convincingly play the feed role to the Doctor's explanations, but Duggan - previously only dealing with divorce cases - is perfectly poised to ask what the hell is going on. 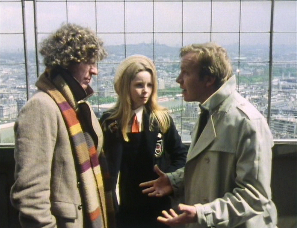 And that's why we were sad to see the Doctor and Romana running across the Champ de Mars as they waved goodbye to Duggan. WE WANTED HIM IN THE TARDIS! And, don't forget, the show's been running for over 50 years now. We'll be the first to admit that perhaps his character is a little cartoony at times, but there was still potential for him to have a decent run in the series. Akin to that of Harry Sullivan's tenure. Just imagine Duggan hitting the creature in The Creature from the Pit! And, oh dear Lord, Duggan teaching Adric how to deliver a right hook! It's too amazing for words! In a way, though, perhaps Duggan is best as a magical one off where the show was at it's creative best. We may not have had long together, Duggan, but we'll always have Paris. The Amazing Maurice Colbourne - What a Guy! There were no frills to his menace, no cartoonish violence, just gritty determined power. Here was a man who lit up the screen and captivated your attention every time he confidently strode in front of the camera. Damn it! Michael Colbourne was fantastic! Born in Sheffield, Yorkshire just as World War II broke out in September, 1939, Maurice Colbourne found himself going by the unassuming name of Roger Middleton. His career prior to acting was almost as varied as his acting roles. After finishing his education he began an apprenticeship as a stonemason, but soon changed his mind as his heart ached for a life at sea. Legend has it, though, that after heading to Liverpool he was discouraged from a seafaring trade after a bus conductor pointed out a group of unemployed seaman. Determined to fill his back pocket with some cash, Middleton headed across Lancashire to the bright lights of Manchester. It was here that he found employment as a fairground roustabout and furniture removal man, but neither satisfied his desire to make something of himself. With nothing to lose he headed to London with ambitions of becoming a writer. However, as with most writers, he struggled and found that being a waiter was the only way to make ends meet. After meeting the film star Tom Courtenay in the early 1960s, Middleton suddenly found the inspiration he had been seeking. He was going to become an actor. Much like the characters he would later portray on screen, Middleton was fuelled by a gritty determination. Despite initially being turned down for a scholarship at London's Central School of Speech and Drama, he persisted and eventually gained a place. It was after graduating that Roger Middleton took the stage name of Maurice Colbourne. With a measured dose of macabre irony, the name had previously belonged to a now deceased Shakesperian actor with whom Middleton shared the same birthday - 24th September. Colbourne's first tentative steps into the world of acting came in repertory and alternative theatre. Serious about his art, Colbourne took an abandoned synagogue in East London and founded the Half Moon theatre. It was here that he could act, direct and write without the shackles of the establishment around his creativity. However, the confines of the stage were not enough for Colbourne. He wanted a bigger audience. The first role of note he achieved was that of a villager in the 1970 Vincent Price horror film, Cry of the Banshee. Still, though, Colbourne wanted more. He needed a leading role to confirm his talents. It was in the BBC's 1975 Play for Today feature Gangsters that Colbourne first entered the public's consciousness. Playing John Kline, Colbourne found himself as an ex SAS man working undercover for the intelligence services in Birmingham. With a handy pair of fists and an eye for the ladies, John Kline was an enthralling character who charmed viewers. The BBC were equally impressed and two full series of Gangsters followed. 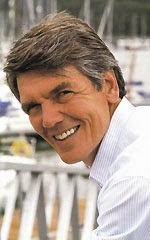 Colbourne was now a recognised face and found himself winning roles in established shows such as Van der Valk and The Onedin Line. Colbourne found himself in the running for the role of Roj Blake in Blake's 7, but ultimately this went to Gareth Thomas. However, sci fi would come calling again in the shape of the BBC's 1981 adaptation of John Wyndham's The Day of the Triffids. Playing Jack Coker allowed Colbourne to highlight his talents for weaving a complex character full of faults, but also a boldness to make a difference. 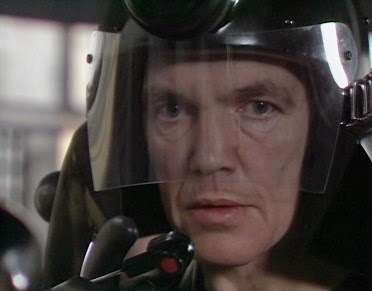 Perhaps his best known role in the sci fi world was that of Lytton, the mercenary who appeared in two Doctor Who serials during the 1980s: Resurrection of the Daleks and Attack of the Cyberman. Colbourne's first appearance on US TV would come in 1985 in the poorly received Hitler's SS: Portrait in Evil - Colbourne briefly plays a sadistic SS guard, but don't expect to catch this on TV anytime soon. 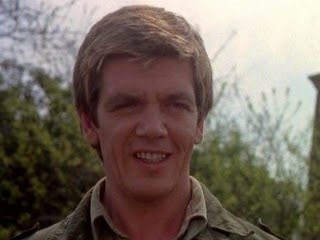 1985 was a busy year for Colbourne and culminated in his best known role - Tom Howard in Howard's Way. This was the BBC's response to glossy American soaps such as Dynasty and Dallas which were dominating the ratings. Colbourne's character marked a departure from his usual roles as Howard's Way centred upon the comparatively sedate world of yachting. The show was a huge success for the BBC and planted Colbourne in prime time Sunday viewing for several years. Sadly, Colbourne would not see the culmination of the series. Just as Colbourne had become a household name, tragedy struck as he died at the untimely age of 49. He had been busy renovating the family holiday home in Dinan, Brittany; France when he collapsed with chest pains and died of a heart attack. Colbourne left behind his wife of 10 years Chan Lian Si and their daughter, Clara. We can't lie, we're utterly transfixed by Michael Colbourne whenever he's on screen. There's something so powerful and demanding about him that we can't help but enthuse wholeheartedly. 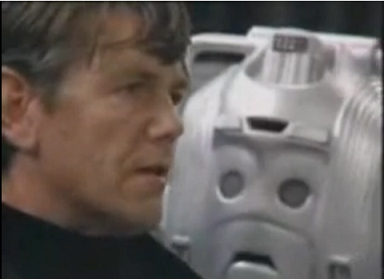 Our first encounter with him was as Lytton in Doctor Who. He was a nasty piece of work at first, but later showed signs on warmth, all delicately translated by Colbourne's menacing performance. And just think, he double crossed the Daleks and the Cybermen. He just did not give a solitary damn! 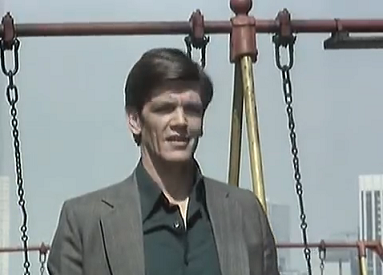 Colbourne's best appearance, in our opinion, is of John Kline in Gangsters. A sterling tour de force throughout the first series, he punches, threatens, gambles and loves his way across the gritty urban landscapes of Birmingham. The second series is, well, a bit surreal to say the least, but Colbourne is still in fine fettle. It's just such a shame that his career ended prematurely. He still had so much more to give. The Glasgow Herald, whilst covering his death, referred to his main passions as being "horse racing, fishing and being at sea" - the epitome of not just a man's man, but also the majority of his characters. The world is an incredibly curious place to a child and each new day brings endless questions about the crazy planet they're growing up on. Why can't we walk on the ceiling? Why do helium balloons float? Why can't we see the individual beats of a hummingbird's wings?! It's tough to answer these questions as children have notoriously short attention spans akin to that of an adult playing Candy Crush Saga. Just imagine, though, if you could combine these complex answers with a little bit of fun to keep them hooked. You'd be Over the Moon. Sam Dale is the studio bound presenter with few props, but plenty of conceptual knowledge to share with the inquisitive kids of Britain. And Sam isn't in a mood to mess about. He's going to get deep into branches of science that many adults struggle to grasp. Gravitational pull? Sure, he'll take the basics of that and feed it back to knowledge hungry kids. The differing densities of gases? No problem, just give him a balloon and he'll do the rest. Halftone reprographic techniques? WHAT?! It's not all complex science wizardry, though, there's something to keep the adults entertained too: CARTOONS! The animations are inspired by the show's theme, so, for example, in the episode looking at camouflage, we're treated to Jasper Carrot singing a song about Angus McBluff - a Scotsman keen on animal photography, but unable to get close enough to his subjects without scaring them off. Other stars popping up to provide their vocal talents included: Derek Griffiths, Don Spencer, Carol Leader, Kim Goody and Barbara Courtney King. First broadcast in 1978, Over the Moon aired in the children's lunchtime slot on BBC1 and consisted of 13 episodes all around 15 minutes long. The series was written and produced by the magic hand of Michael Cole (who else!) and he was aided and abetted by director Martin Fisher. 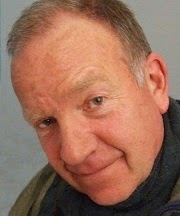 Peter Gosling provided the music for the series. The series was repeated on BBC1 a couple of times and one episode popped up on BBC2, but it was last seen on our screens way back in 1982. 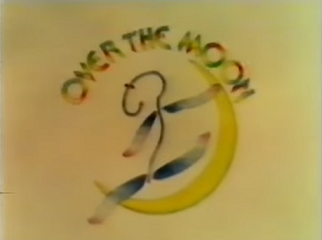 Over the Moon was last broadcast a few months before we were born, so sadly our super absorbent child's brain was never exposed to it. It's broadcast dates also mean that any VHS home recordings are likely to have long since disintegrated or been chewed up, so YouTube houses nothing but the theme tune - better than nothing though, right? The good old folk at the BFI Archive, though, came running to our aid once again without so much as a complaint about our never ending demands. There wasn't too much information online, so we weren't entirely sure what to expect. Apart from a Jasper Carrot song. Perhaps we slightly exaggerated the level of science at play within the show, but it's still remarkably clever and wouldn't give a child much time to let their mind wander. Thankfully, Sam Dale frequently carries out experiments designed to capture even the most errant child's attention. The cartoon sections act as a fun breather for the kids, but even then their brains are still subconsciously linking the animated japes with the theories they've just learned. We only saw two animations, one with Barbara Courtney King's singing which failed to grab us, but the Jasper Carrot one was a rollicking laugh riot. The mixture of science and fun is just right, but the show doesn't quite hit the classic highs of other Michael Cole productions. Although interesting, the series doesn't have that vein of rich charm running through it that shows such as Gran, Bric-a-Brac and Bod had. A solid show, then, but one that's merely serving canapes at the great party of classic children's tv.